May is one of two months of the year whose name is also a verb (the other being March). In the case of May, it is an auxiliary verb, one that modifies another action, but not like an adverb…enough with the grammar lesson! The point is this. May is a month of action…perhaps. I may go on a bike ride. I may eat more vegetables and fruits. I may go to bed earlier to get more rest. One of the things that wellness coaches listen for in coaching conversations is called ‘change talk.’ The words used by people in their conversations (and in their self-talk) often give clues to just how ready they are to change their behaviors. Let me mention a few examples. Phrases like “I won’t” or “I can’t” typically put a person outside of the range of probable change, at least in the near term. “I might” or “I may” brings them a step closer, and indicates that it is at least within the realm of possibility that change could happen in their lives. “I will” is a sign that they are actually preparing to make a change of some kind, and “I am” signals that change is in the works. Getting back to the month of May, this is also a time of year typically associated with wind (like this past weekend! ), and flying kites and such. Which brings to my mind the phrase, “winds of change. “ What better time of year to make changes in your life than when the winds of change are present! Most of us have had some experience both with running into a headwind as well as being pushed along by a tailwind. And it’s much easier to have the wind blowing in our favor. My first 50-mile race down in Kansas this past weekend was proof of that in spades. That’s a topic for another blogpost, though. But regardless of the wind’s direction, if you know how to harness the energy of the wind, you can make significant progress on making changes in your behaviors that will move you down that road to better wellness. 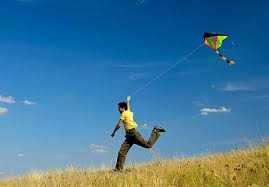 From the sailor’s perspective, “It is the set of the sails, not the direction of the wind, that determines which way we will go.” And if you are into flying kites, you also know that nothing will happen until a nice, stiff breeze comes along to lift your kite into the air.